Bar|Scan delivers Unique Identification of Items (UID) compliance to a large defense contractor in support of multiple vessels. Using the 2-D matrix scanning capability of the MC5590 plus Bar|Scan software, items are scanned and the inventory information is sent from ship to shore using email accounts. Contact us to see how we can help you. 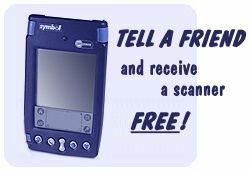 Referrals which result in a Bar|Scan system sale will be awarded a free* Symbol 1550 Palm scanning device complete with Bar|Scan software!